Since I left things off last week with two reposts, I decided to continue my summer wrap-up week into this week with a few more “new” posts. 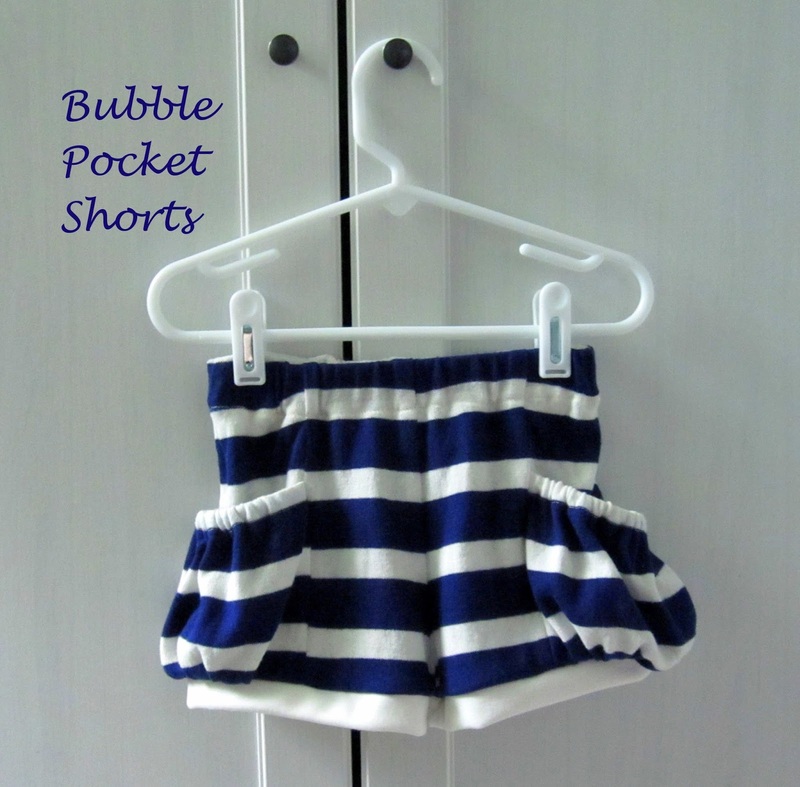 We’re now on day six of the wrap-up and moving on to Bubble Pocket Shorts (*affiliate link). 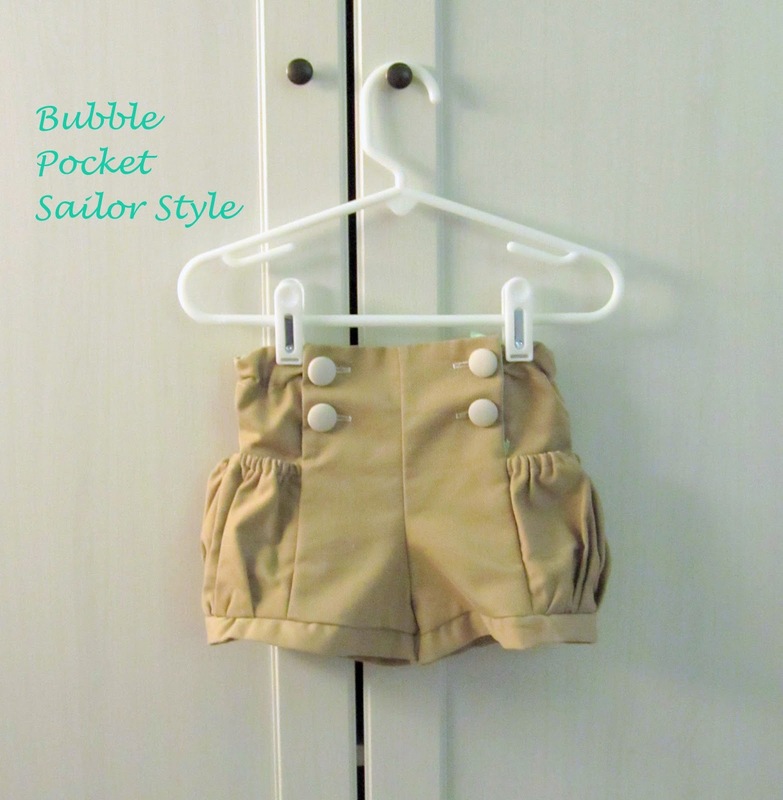 I made several different pairs of Bubble Pocket shorts this summer and it’s hard to decide which one I like the best. They are a really great style and fit and even though they look extra complicated the pattern whips together so it’s a big win. 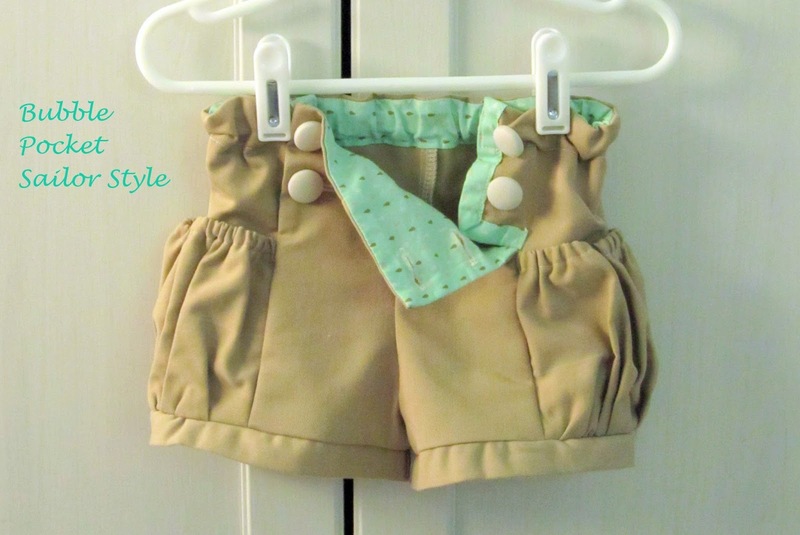 Other than the Doli tank, these shorts are by far my favorite pattern for Bean this summer. I already showed you my Flipped Ruffled Front Pocket Shorts and these were the second pair I made. I was really pleased with how the ruffled pleats worked out with the shape of the front. The first pair I made were actually blogged about after the flipped ones. Paired with a matching Doli Tank they were a huge hit this summer. The next pair were made out of leftovers of the same old navy sweater that I made Bean’s Anywhere dress out of in the spring. I love the soft feel of the sweater fabric with these shorts. They must be the most comfortable shorts to wear ever. Bean wears them all the time and they’ve quickly become the go to shorts I grab out of the closet. They look super cute with the Peter Pan Collar Tee (affiliate link) and you may have already seen them on her when I blogged about the tee here. The most recent pair I made from and old pair of khakis that were too worn for my husband to wear to work anymore. These are the first “sailor style” that I’ve made and I know I’ll be making a couple more next summer. I was worried about the buttons being too much of a pain to open every time Bean needed to go potty, but with the button hole elastic (too bad I didn’t know that stuff existed way back when. I first saw button hole elastic inside the legs of one of Bean’s cloth diapers and I did a big forehead slap and grabbed some at the store the next time I was there. duh) running through the back waist these actually come up and down without even having to undo the buttons. Although when you do undo the buttons, you see that I used a cute contrasting fat quarter that I had on hand to line the flap and the waist band. I love these little touches. I even made the buttons out of some left overs of the pants that were upcycled for the flipped pocket shorts. 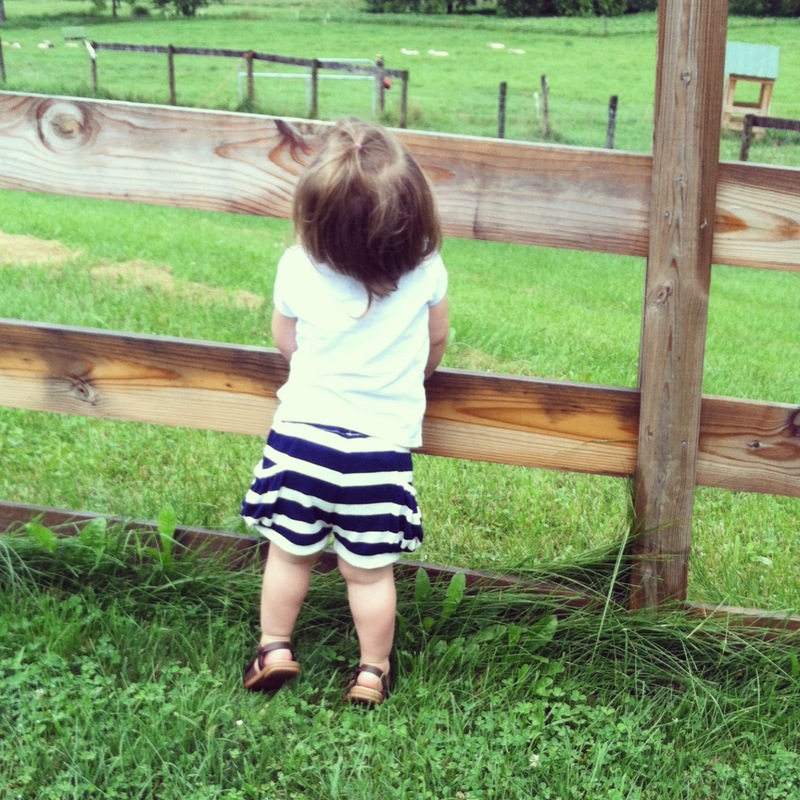 This picture was taken at the farm down the road, but Bean wore these pants in some family pictures we took when we visited Massachusetts this summer. She wore the Peter Pan Collar Tee as well just because I cannot get enough of how cute they look together, hehe. 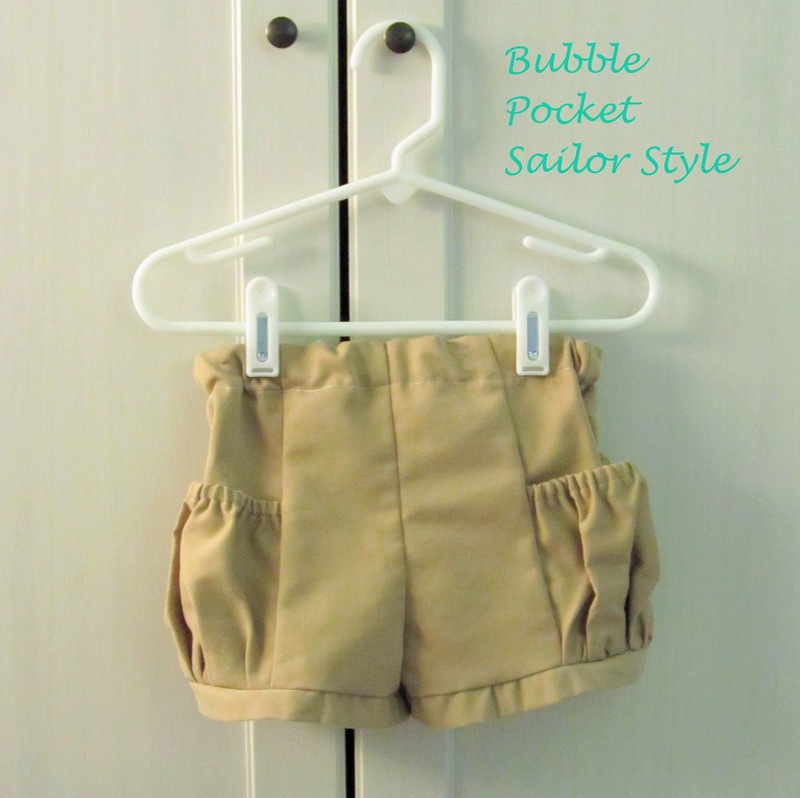 I love the bubble pocket shorts! How great that hers go so nicely with so many things. I agree..the small details really make a garment. I love your contrast lining! That was the first pattern I used with adjustable waistband, I had no idea how easy it was. So great for growing kids!! They are all so cute! Can't go wrong with bubble shorts. I know this post is about the shorts but I am so in love with that blue shirt. It looks so good on her and it's really cute!! I love the sailor front! All the shorts are cute, but I think that last pair is my favorite.